This workshop is perfect for jewelry, mixed media, and recycled art students who don’t want to use a jewelry torch but who need to be able to attach items such as stones, photos, polymer, paper, and more to jewelry and metal objects. Students will be drilling, piercing (sawing), cutting sheet metal, and more, but it is a low tech class using few required tools. The class will cover the creation of Egyptian spiral chain, Viking (knitted) chain, wire-wrapped links with beads chain, and basic link chains. Tuition needs to be paid with your early registration and is $68. The materials fee, $30, will be paid to the artist on the day of the class. Join one of our favorite jewelers, Joy Raskin, to explore the colorful, fun world of resin to add color to your jewelry! Explore the colorful, fun world of using resin to add color to your jewelry! Using 2 part quick setting epoxy, we will add paint, herbs, tea leaves, colored powder, glitter and much more, mix epoxy and color together, and apply onto jewelry. Instead of using stones to set in jewelry, why not use resin? Works great for jewelry with texture, recessed areas, empty stone settings and anything else that you want to try. 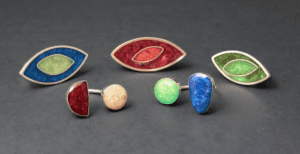 Instructor will provide epoxy and some coloring agents, but students should feel free to bring anything that they want to add to epoxy to make resin-filled jewelry. Even twigs have been used for resin jewelry! Students should feel free to bring tiny beads, stones, or other material you’d like to set or incorporate into your jewelry. Tuition is $68.00 per student with a $30.00 materials fee paid directly to the instructor at the start of class. Join one of our favorite jewelers, Joy Raskin, to learn how to make bangles, cuff bracelets, and rings. In this one day workshop, we will make bangles, cuff bracelets, and rings. Simple wire rings and bangles will be soldered together, hammered for texture and embellished with wire working. Cuff bracelets will be made from sheet metal that is textured and shaped into a C-shape bracelet. You will leave with new rings and bangles that you’ve made yourself that will make great gifts! 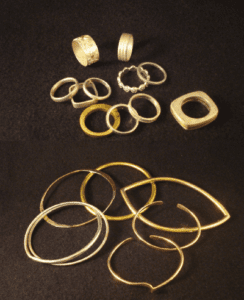 Instructor will provide brass, bronze and copper wire and sheet metal, and a limited amount of silver wire. Students should feel free to bring beads, stones, or other material you’d like to set or incorporate into your jewelry. Tuition is $68.00 per student with an additional materials fee of $20 – $40 to be paid to the instructor at the time of the class (materials fee depends on the amount of silver used).